Goldenseal root has been used by Native North American healers for a wide range of ailments including for local inflammations and infections, especially in the digestive tract. The plant was also utilized to improve digestion as a bitter tonic. An infusion of the root was used as a soothing rinse. Formulated as a bitter, it supports digestion and stimulates appetite. It also soothes digestion and exerts a mild laxative effect. 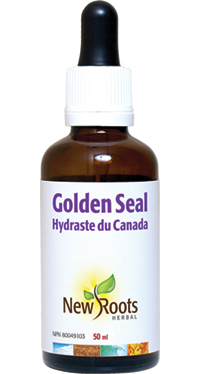 The active ingredients of goldenseal include a group of alkaloids, including hydrastine and berberine; these are strongly astringent and help reduce the inflammation of mucous membranes. These compounds also have antibacterial properties and stimulate peristalsis. Berberine further induces the secretion of bile, which is critical for digestion of lipids within the small intestine. Goldenseal root is used for inflammation within the mucous membranes throughout the entire digestive system, which can contribute to gastritis, flatulence, diarrhea, and dyspepsia. Native North Americans used the plant for diarrhea, dyspepsia, and flatulence. It could prove to be a simple therapeutic measure to help with multiple aspects of your digestive health. Adults: Take ½ teaspoon daily or as directed by your health-care practitioner. Other ingredients: Purified water and organic alcohol (25%).